Investing in the right forest harvesting equipment can take your operations from mediocre to the most successful and competitive. For all your forestry applications, Gregory Poole offers feller bunchers for sale as well as harvesting equipment that’s useful whether you’re forging and maintaining roads, logging, managing land or working in the mill yard. We provide a range of reliable and powerful solutions that uphold modern technology and safety measures to help lower costs and boost worksite efficiency. In most cases with road building, before the real work begins, you have to rely on machines like dozers, excavators and motor graders along with work tool attachments for versatility. Gregory Poole Equipment Company helps you clear the way. Working in the mill yard also requires specific machines for loading, unloading, sorting, stacking, feeding, recycling, cleaning and other tasks. We provide multi-purpose machines to get the job finished like wheel loaders, material handlers and dozers. 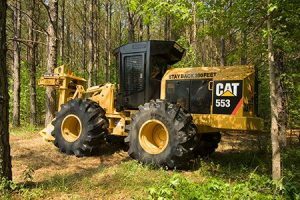 Land management work like clearing brush, making a right-of-way and reforestation means you can implement specialized machines like multi-terrain loaders, excavators and dozers. But when it comes to the real work of harvesting, you can trust our Cat® harvesters and feller bunchers. Caterpillar® harvesters and feller bunchers, combined with harvesting and felling heads, provide versatile and robust machines that are built to withstand even the toughest forestry applications. Whether you are working in thinning or final felling applications, these powerful timber harvesting machines will help you increase your productivity. Logging a small plot or an entire forest? Operate with our fuel-efficient machines that are purpose-built to extract, harvest and load. Harvesters are designed with durable and robust undercarriages for demanding terrain and in a variety of timber size classes. Gregory Poole offers the 521B Track Harvester, 522B Track Harvester and 501/501D Track Harvester. Each can cut at the base of a tree, harvest it and slice it into needed lengths all in one step. With its processing abilities, a harvester is one of the most efficient pieces of machinery you can own. Track and Wheel Feller Bunchers have exceptional balance and stability for high production timber harvesting. Our feller bunchers can cut trees at the base and gather multiple trunks at a time. Its tree-grabbing device is equipped with a saw for fast operations. You can then stack piles of trees onto a skidder, yarder or forwarder for transportation. Several of our bunchers for sale include the 521B Track Feller Buncher and 563D Wheel Feller Buncher. Whether you’re searching for a log harvester for sale or other timber harvesting equipment, Gregory Poole has your best interest in mind. Our professionals will work with you to help you decide on the perfect machines to suit your jobs. Browse through our harvester headers for sale along with our other forestry equipment. You can also fill out our contact form or call us at (800) 451-7278 to learn more.